CPSAC provides quality, professional training for professionals in the fields of healthcare, injury prevention, fire, police, emergency response, family resource, social work, childcare, retail, as well as parents, caregivers, and advocates. Those certified with another child passenger safety organization may wish to add or transfer to CPSAC-certification; details are here. Upon completion of the CPSAC Child Passenger Safety Technician (CPST) training course, successful candidates will receive a professional certificate that is nationally recognized across a number of fields. CPSAC can provide training to professional organizations as part of their continuing education requirements, or to professionals who are looking to expand on their knowledge and services. Training is available to all interested parties, regardless of professional affiliation; members of the public often work alongside fire and rescue, police, doctors, nurses, and other professionals both during courses and in providing services to the public after training has been completed. Note that the minimum age for CPST certification is 16. What is the Child Passenger Safety Technician training program? The Child Passenger Safety Technician (CPST) training program is a nationally-recognized, standardized, professional training and certification program provided by instructors in communities throughout the country. Our training program provides course participants with the widest range of information and knowledge available in Canada on child passenger safety. This includes best practice recommendations, occupant protection systems, child restraint use, the law, and more (course syllabus available here). The training will prepare you to use your technical and practical skills to help families at clinic events, private seat checks, workshops, community events, or within the confines of your job. Certification requires a combination of classroom and hands on time totalling 14-16 hours, a written exam, and a practical exam in the form of a public seat check event that is at least three hours long. Participation in all components is required for certification. Classroom hours are scheduled according to the needs of the instructor and the training group but the two most frequent schedules are two days of classroom time with a clinic the third day, or an evening plus two full days of classroom plus clinic. Certification is valid for three years, and requires completion of two online updates in that time period, and either fifteen documented seat checks OR participation in three peer coaching sessions. Recertification may be done online in most cases. You could save a life. It could be the life of your own child, a family member, or a friend’s child. As a technician you can do any number of things to educate and advocate for child passenger safety. Some take it for their own interest only, and others take it because they want to share their knowledge with others. You can use your certification as a volunteer in your community, as a supplement to your professional occupation, or as a professional occupation in of itself. Some technicians volunteer their time at seat check events in their community, and some choose to work primarily private checks. Others participate in community workshops, or become an embedded source of information for their workplace. Successful completion includes three years of liability insurance when volunteering (if you’re charging a fee or providing child passenger safety information through the course of your employment you need separate insurance, also available). You also get access to a tremendous network of Canadian technicians and instant access to peer-to-peer support. It’s very rewarding to help parents, or simply to know that you’re keeping your own kids as safe as you are able. 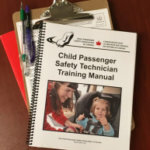 CPSAC encourages technicians to continue working as part of a child passenger safety team in order to continue to learn and grow as a technician. Your instructor will provide all materials. You may wish to bring a highlighter if you like to mark up your course manual for studying. Wear comfortable clothing and appropriate footwear, as you will be climbing in and out of vehicles. Tie back long hair, and trim long nails. Uniformed professionals may wish to be in uniform for the clinic portion of the training, but will probably be more comfortable in street clothes for the classroom portion. Is there a course available in my area soon? You can consult our events page for upcoming courses, or by contacting the registrar at registration@cpsac.org. We will ensure that you are notified of all course options in your local area, including available spaces in closed professional courses that may be available to members of the public. We also have a mailing list specific to course registration. Please complete the form here if you wish to be updated on course offerings in your province. Can I bring my nursing infant? Because CPSTs are providing services to families with young children, many people who are interested in becoming certified also have young children. Some instructors may allow non-mobile infants in the classroom portion of the course, so long as those course participants are considerate of the other students in their classroom. This requires an awareness of your child’s temperament and your own limitations in a classroom environment. Alternate childcare arrangements are mandatory for the clinic portion of the course. Groups and individuals interested in obtaining training can contact the registrar at registration@cpsac.org. Technicians certified by the Infant & Toddler Safety Association (ITSA) are asked to please contact registration@cpsac.org for more information. Successfully complete an in-person session with an instructor. This training will be composed of 2-3 hours review and demonstration, a 1 hour written multiple choice exam, and a 3+ hour public seat check event (practical exam). These components may be split over more than one day. Fees vary based on instructor’s costs. If you are an instructor with another CPS program please reach out to registration@cpsac.org to discuss options with CPSAC.